"The tight labor market got tighter for small business owners last month, continuing a year-long trend. Fifty-nine percent of owners said they tried to hire in October, with 88 percent of them reporting no or few qualified applicants." "Consumer sentiment surged based on optimism about jobs and incomes, an encouraging development as consumers account for 70 percent of GDP," said NFIB Chief Economist Bill Dunkelberg. 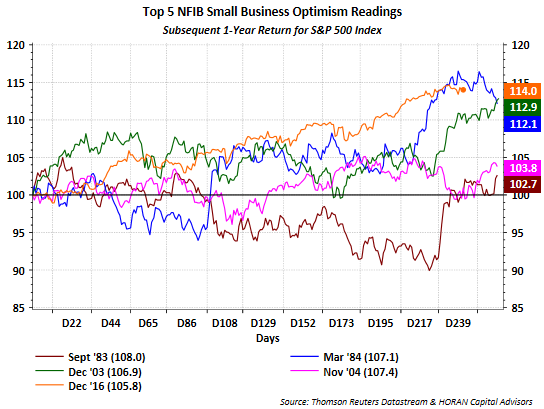 And continuing to track the market's performance from December of last year (January's report) when NFIB reported one of the highest NFIB readings, the current S&P 500 Index return is outpacing prior market returns associated with high NFIB readings as seen in the below chart. 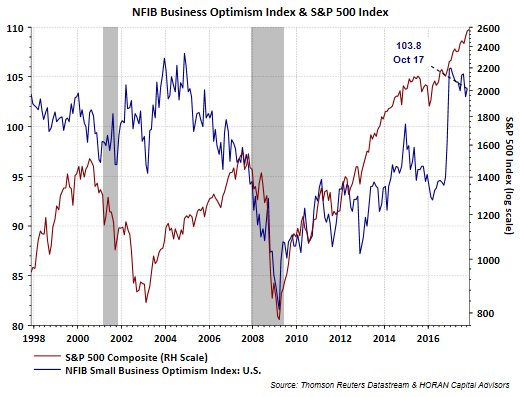 With a surge in consumer sentiment and a small business environment that is showing continued strength in hiring, these two factors alone should serve as a tailwind for the economy and market in the months ahead.